I've read on the Cavies Galore msg board about people using & recommending towels as an alternative to bedding. I must say I disagree with this! 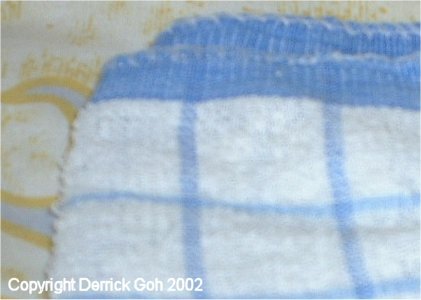 Firstly, towels can get wet easily & knowing how much those furballs pee a day, the towels would be wet in no time. You'll probably have to change towels at least 3 or 4 times daily if not they'll be sitting on pee soaked towels. That's a good way to catch a cold or develop skin problems. Also, you need to ensure the towels are thick enough 'cos thin towels have little absorbency. Don't forget that this is a humid country & it takes much longer for moisture to evaporate than in America. Cavies love to chew & the risk is that they may chew the towel & end up ingesting some of the towel fibres. This could result in intestinal blockage which is obviously not good! When your cavies move around (especially when they run) there's also the risk they may catch their toe nail in the fibres. That's a good way of ripping off a toe nail, or worst still breaking a toe! Take a look at the pic above or just grab any towel & take a close look. I'm sure you'd see many small loops. That's exactly what they will get their toe nails caught in! So even though towels are not toxic & can't be considered lethal bedding, I do not recommend it. If cavy chews on towel, it may choke on fibres! Cavy may get toe nail caught in fibres. Can result in broken toe!